Advanced Contexts Manager - Joomla extension that allows context-based web site architecture. 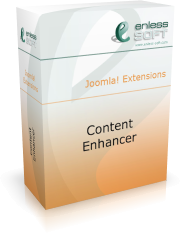 Content Enhancer is a native Joomla 1.5 extension that allows you to define content items and content replacements. Content items are variables or constants that could be used in many places across the web site. Content replacements are a way to replace predefined content part(by text or regular expression) with other content(static or dynamic). Content Enhancer also gives the ability to use content items in module parameters. If this sounds too abstract or unclear, here are some examples. a static link, for example "index.php?option=com_content&view=article&id=5"
a dynamic link, for example "index.php?option=my_component&id=[request:id]"
replace "car" with an HTML that pops up an advertisment when the user moves the mouse cursor over "car"
More detailed explanation of content items, content replacements and the benefits of using them could be found here. Video tutorials are now available for Content Enhancer. You can watch them here.